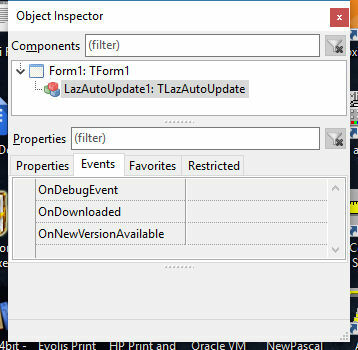 LazAutoUpdate is a visual drop-in component for the Lazarus/FPC IDE to make updating your application from an online source easier and smarter. When making an app for distribution, coding an update process for users can be a bother, yet users appreciate the facility (so long as it's not forced on them!) and support is easier if you know that the user always has the most up-to-date version of your app. LazAutoUpdate is designed to integrate well with your SourceForge or GitHub version control ensuring a trouble-free experience for you and your users. This means for example, your app can 'check for updates' at startup without the app becoming unresponsive. It is aimed at Lazarus Windows and Linux developers who host their project in SourceForge or GitHub. You (the developer) have plenty of control over how the component behaves, yet it is simple to use. This gives you the 'bare bones' of the update code for your application. As you can see, it's all pretty automatic and simple. There are also events fired: OnDownloaded and OnNewVersionAvailable and the property LastError with info that you might use for debugging. LazAutoUpdate is supported via the Lazarus forum here. Use UpdatePack to manage the process. 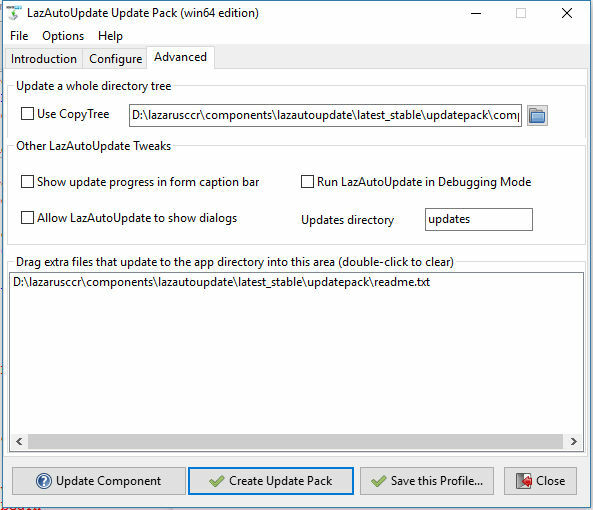 UpdatePack is a GUI application that makes the update files accurately and quickly, and even gives you the corresponding LazAutoUpdate code for your app. It uses 'profiles' that enable you to deploy future updates by simply updating the version number and clicking 'Create Update Pack'. If you want to make up (or add to) the update zip yourself, it should contain the App and the text file 'whatsnew.txt' as a minimum. When ProjectType is set to auOther, LazAutoUpdate will use these properties for all the Methods. See example application in the SVN archive. This can be found in the /trayicon folder of the source. Systray (lautraynotify) picks up entries from apps that use LazAutoupdate automatically, so it never needs to be configured - simply installed once and forgotten. 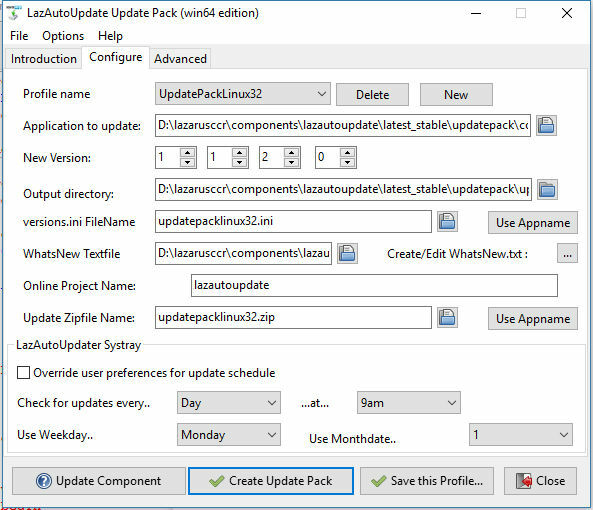 The UpdatePack takes care of producing the systray configuration file for your app. The default is to check every Monday at 9am. The systray app works in both Windows and Linux - all you need to do is deploy it. Here's example code to use LazAutoUpdate to download then run an application. The user would download a small InnoSetup installer with just the online installer/updater, which in turn would download application(s) and supporting files. Of course, the "installer" could be your main application, with sister applications installable via a menu or some such. Each application to be updated should have a unique name for the versions.ini file. Set the VersionsINIFilename property. VersionCountLimit property determines how long LazAutoUpdate will check for a new version before timing out. DownloadCountLimit property determines how long LazAutoUpdate will try downloading the new version before timing out. Windows 10 security will not allow a non-admin user to update applications from the internet (unless it's a Windows Store App). This is a sensible policy in my opinion, and LazAutoUpdate adheres to it. If an 'ordinary user' tries to update an app using LazAutoUpdate, all will go smoothly until the final 'Update app' phase. At that point LazAutoUpdate will pop up a dialog informing the user that an administrator account is needed for the actual update. For an 'admin user', LazAutoUpdate will pop up a UAC dialog (the same as any installer) and proceed upon clicking 'yes' to do the update. If you wish to circumvent this (perhaps with a manifest) LazAutoUpdate has the public property 'WindowsAdminCheck' which you can set to FALSE and avoid the dialog. Linux will do the update without even showing the update console, and the user gets a seamless experience. Updater copies /updates/UpdatedApp to App directory. Download happens in the background (via a background thread) Optional 'download counter' is shown to indicate progress. This page was last modified on 13 February 2017, at 11:21.